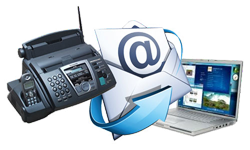 Package Plus Inc. offers a Public Fax Service for receiving and sending faxes. Our fax machine is on 24 hours for receiving, and we will send faxes anytime during our business hours. The phone number for our fax machine is 705-749-1614. Should you need a document, manuscript or photo scanned and sent in an Email, we can also help you with that!